Choosing a needle tip is a key component of the print parameter optimization process. It has a significant effect on the optimal printing speed and pressure, as well as the resolution of the print. The needle also determines the shear stress that the cells experience, which will greatly affect cell viability. The gauge of a needle indicates what the diameter of the opening is. The higher the gauge, the smaller the diameters. 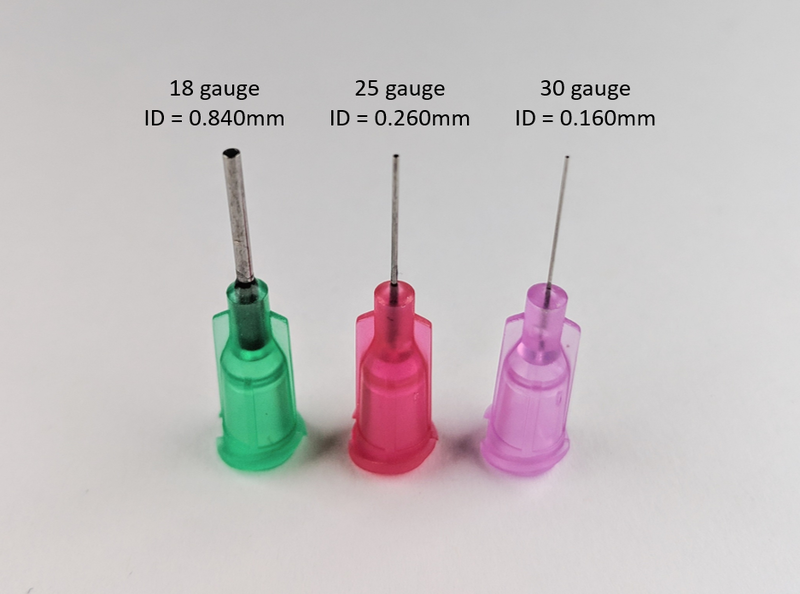 For example, a 30 gauge needle is thinner than a 25 gauge needle. Different companies use different measurements for gauges, so it is important to specify inner diameter. A higher gauge (smaller inner diameter) leads to a higher resolution. However, a smaller hole increases the resistance against getting material through the needle. Therefore, it increases the required pressure for printing, which can decrease cell viability. It also can decrease the rate at which material is extruded, which decreases the speed at which you can print. Application-specific note: For researchers only interested in using bioprinting for 3D biology, resolution may not be as important. These users should consider using lower gauges (larger diameters) to increase the printability, as well as lower the pressure and stress that your cells undergo. Longer needles can be useful for reaching into deeper well plates or when printing in a FRESH slurry. The longer the material has to travel, the greater the pressure required to push it all that way. Therefore, materials that already require high pressures work best with shorter needles. Also, it should be kept in mind that since a longer needle requires more pressure and will increase the stress that cells experience, it could be detrimental to cell viability. Application-specific note: If you use a hydrogel that is very non-viscous, shape fidelity can be a challenge since the material cannot support its own weight. We recommend using the FRESH method to act as a support. Long needles are great for this application because the liquid-y hydrogel doesn’t experience high shear stress and the length allows for bigger structures in FRESH. Needle profiles are either straight or tapered. Straight needles require higher pressure and can be more prone to clogging. However, straight needles are very useful for printing in FRESH, since they cause minimal disturbance to the slurry. Tapered needles can significantly decrease the pressure needed and reduce clogging. Needles can be made of plastic or metal. Plastic needles are common for most hydrogel prints. Since thermoplastics typical have melt points of over 60°C, metal tips are required. Metal nozzles also provide better thermal conductivity. Application-specific note: If you are doing bone or cartilage research (or anything using thermoplastics), you will have to use metal needles. Most of the metal needles will also be tapered, which helps decrease the high pressure needed to extrude thermoplastics. Since thermoplastic prints are acellular, concerns about cell viability aren’t applicable. At the Allevi store, we provide a wide range of plastic and metal needles to fit your every need. Still have some questions or need help choosing between needles? Email [email protected]!